The importance and advantages of biological control methods in pest management strategies for plant protection are well recognized. Egg parasitoids are among the most significant biological control agents of a number of major insect pests, including pests of corn, sugar-cane, cotton, fruit trees and vegetables. Parasitoid species are widely distributed throughout the world and by far the most important are the tiny wasps of the genus Trichogramma. It is estimated that world-wide more than 32 million hectares in agriculture and forestry have been treated annually with Trichogramma. 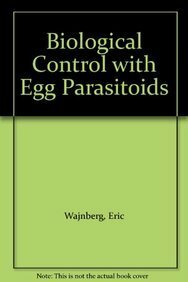 This book is the first to provide a broad overview of the use and potential of egg parasitoids in biological control. Its twelve chapters, written by international authorities from Europe, North America and China, cover both theoretical and practical aspects and have been developed by members of the working group 'Trichogramma and Other Egg Parasitoids' of the International Organization for Biological Control (IOBC). The book is thus aimed at a wide audience of advanced students, research workers and advisers in biological control, entomology and crop protection.